How can life be any better than to have a Son that you are extremely proud of! who turned out to be a pretty great guy! We've recently got some press....Please slide down on the page to see it! FOLLOW US ON OUR BLOGS! Reitmeier.com Google may give a warning...it's bogus the site is clean/safe! It was an honor for me to help John Reitmeier, of Crookston, find his biological family. You may have read the story in the April 28 edition of the Grand Forks Herald. 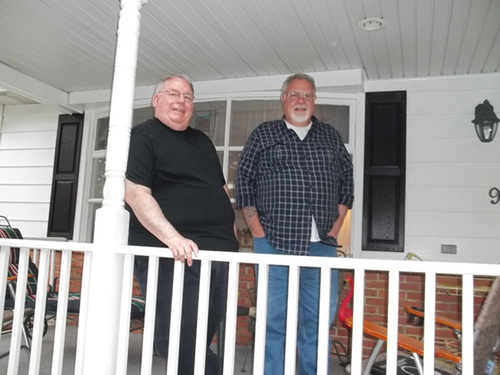 Being with John and his sister, Jane Reitmeier, in Charles Town, W. Va., the weekend they met John’s biological brother, Michael Terry and family for the first time was, well, a double header privilege. It was an unforgettable weekend for everyone. John and Jane drove to West Virginia. I flew and they picked me up at Washington D.C.’s Dulles Airport. John had made the statement, “Jane loves to drive and I love to let her.” As it turns out, Jane drove 99 percent of the 3,400 mile round trip. Jane also is from Crookston where she is an admitting clerk and switchboard operator at Riverview Hospital. Now I realize Crookston’s rush hour traffic is quite different than D.C.’s and West Virginia’s – not nearly as many six-to-eight lanes going every which way nor does Crookston have a cloverleaf every few hundred feet. But you would have thought Jane drove on those kinds of highways every day to and from work. She was like old hat behind the wheel. John, with the help of his GPS, was a very helpful navigator. John and Jane took a huge basket of gifts to the Terrys, “local things,” as Jane says. In the basket were bags of American Crystal sugar, Chippers from Widman’s, Minnesota honey and a loon, mugs from the Krazy Kiln Pottery Shop, sunflower seeds from Dahlgren’s, and a candle and candle plate from the Candle Shop, all in Crookston. And, of course Grain Belt Beer. John was a few months old when he was adopted by the late Grace and Willard Reitmeier. He was 4 and remembers the day the Reitmeiers brought Jane home as their newly adopted daughter. Anyone who knows John Reitmeier knows he's never lost for words. 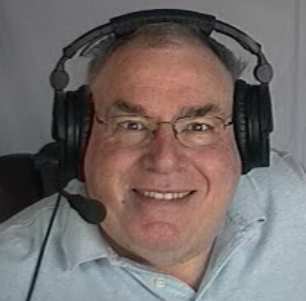 Otherwise known as the Cool Site Pick of the Day guy for 1310 KNOX radio, Reitmeier has quick and witty comebacks for everything, stemming from many years in radio. But on the evening of April 13, John was somewhat subdued as we neared a white house with a full-width front porch situated on a flower laden street in Charles Town. When John spoke it was softly. "I am without words," he said. "It's going to have to fall where it falls." As our car pulled into the driveway, a man and his wife came down from the porch to welcome John. Over the past few months they had spoken on the phone several times and now, John, 60, and Michael Terry, 63, were meeting for the first time. And the brothers embraced. 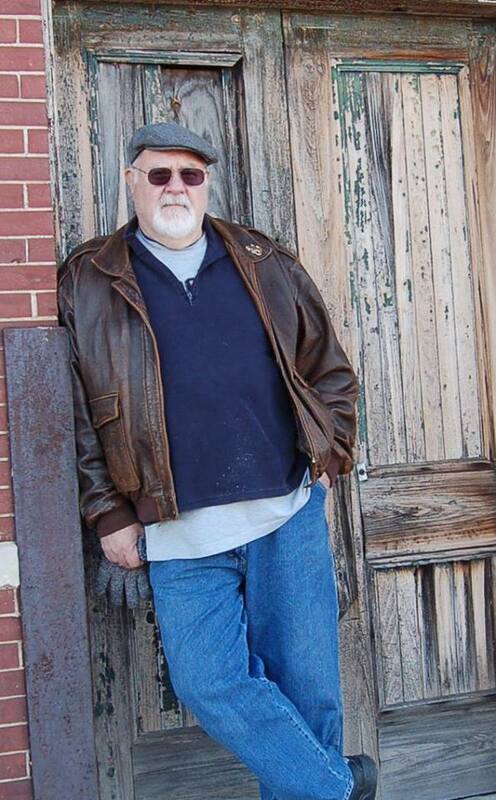 This moment was something John, of Crookston, had been waiting for since beginning an on-again-off-again search for his biological identity more than 30 years ago. As for Michael, well, "in the back of my mind there was some story about a miscarriage," he said. He never knew he had a brother, which, "I've always wanted" he added. "I think it's pretty neat." The siblings learned of one another in August. DNA testing verified they are brothers. Both John and Michael were born to the late Virginia Terry when she was married to James Terry; John in the Twin Cities and Michael when the family lived in Wisconsin. The Terry's also had a daughter now deceased. Theirs was not a good marriage and it ended in divorce after John was born. It may never be known why Virginia placed John for adoption with Lutheran Children's Friends Society, now Lutheran Social Services. Virginia requested that her baby be raised Lutheran and he was adopted by Grace and Willard Reitmeier, Crookston. John will be the first to tell you that Grace and Willard were his "real" parents. He loved them deeply and along with his sister, Jane Reitmeier, also adopted, cared for them until their deaths: Grace in 2005 and Willard last year (actually 2 years, Jan 6, 2010). In the back of his mind, however, John always hoped to meet his birth mother. At age 28 and while a student at Brown Institute in Minneapolis, he contacted the agency, which gave him only vague information about his adoption. When he told his parents what he had learned, they told him his birth mother's name. Seven years ago, John started to search again but his parents, being very private people, asked that he stop. Wanting to abide by the Fourth Commandment, which says to "honor your father and your mother," John did stop. After Willard Reitmeier died in January 2011 (actually 2010), John's life felt rather "empty," he said. One day that summer, while on the Internet, he came across the name, Virginia Terry, and his pulse began to race. On July 1, John contacted this writer asking for help with his search. "I need someone to tip the last domino," he said. My phone calls started with a number in Howard Lake, Minn. Several tries - never an answer. I called other numbers under the name, "Terry." People at a newspaper, the court house, the post office, a drug store, a real estate office. Everyone was Minnesota nice - friendly, kind, interested, hopeful for John. But no one had a lead. But on Aug. 15, I tried another number and the one person needed to fill in the gaps answered the phone: Joyce Terry of St. Paul. Joyce also had been married to the late James Terry, who after his divorce from Michael's and John's mother, Virginia, married another woman named Virginia. Two women by the name of Virginia Terry had presented a logjam in the search. Knowing Michael and Debby, Joyce Terry phoned them after she had spoken with me and the next day I received a most welcomed call. "Hello Naomi," she said. "This is Debby Terry. I understand you are looking for us." A new chapter in the life of John Reitmeier was about to unfold. The gathering, on that recent weekend in Charles Town, John met his biological brother, Michael Terry, Michael's wife, Debby, and daughters, Megan, 30, and Meredith, 32. Michael is a retired U.S. Naval officer who works for the Department of Homeland Security in its Customs and Border Protection training center in Charles Town. Corks popped and wine glasses clinked in the Terry living room and around the dining room table. "You had a family," Debby said to John. "This is your bonus family. Michael has always wanted a brother. He's an observer of the human condition and he's been waiting years for a brother like you to take up with him. We have 60 years of catching up to do." Last fall, after learning of John, Michael and Debby sent him photos of his birth mother, the late Virginia Ella Norton. Virginia lived in Orange Park, Fla., with her husband of 32 years before she died in 2001 from kidney disease at age 69. "We are a very close family," said Megan, who wiped quite a few tears when stories of her grandmother, her "Nana," were told. Like the time Nana paid Meg and Meredith a quarter to learn the Ten Commandments. "I'm sad you didn't have a chance to know her, to be raised by her," she told her new Uncle John. Debby presented John with a newly assembled album of family photos. "That's your mother," she pointed out. "And that's Aunt Dorothy." Dorothy is a great aunt in her 90s who lives in Wyoming. John has spoken with her and learned that Dorothy was at the hospital the day he was born but not allowed to see him. John hopes Dorothy will shed light on why he was placed for adoption. John's birth mother was, "a very good Lutheran and very active in her church," Debby said. "There wasn't any gray in her life. It was black or white. You were good or bad. She didn't tolerate misbehavior in children." Virginia, always a secretary, worked for the vice president of RCA and later in a real estate office. "She had a gift for English," Debby said. "She was very bright and very well read." She was a painter, a lover of art. She played ukulele, piano and organ. If she heard a song on the radio she could play it and she had a beautiful singing voice. John spent a lot of time looking through Virginia's Bible. "I see her hand writing on page after page," he said. "This must have been the one she took to Ladies Aid. There are notes and underlines in every book." Virginia kept Family Circus cartoons in her Bible. One caption reads: God invented time to keep everything from happening at once. "If only we could talk across the ages and she could know that we are here," John said as he closed the Bible. He said he has learned two things from all of this. "First, I need to be a more patient person in all areas of my life," he said. "Different from what the world seems to be telling us, things will happen in the time and place they are supposed to happen." The second thing John has learned is "something folks who are blood related and see each other every day will never understand," he continues. "My life is forever changed by having this experience for the first time at 60 years old. I hope my brother will find me worthy to be in his family. It was all worth it." The Herald publishes Naomi Dunavan's "In the Spirit" column the second Saturday of each month. Her email is: naomiinthespirit@aol.com. Her blog: www.areavoices.com/inthespirit. A comment from John. Naomi, in her typical gentle self has underplayed her role in all of this! I feel strongly that without her, I would still be wondering who my genetic family was, where are they? Is anyone still alive? Naomi really get's all the credit in this, she broke through barriers that I feel would have stopped me cold. I owe her BIG TIME! Thank you Naomi. Andrew Seiss is photographed Monday evening at John Reitmeier's home north of Crookston, where he spent the night. He pushes a cart that is packed with all of the supplies he needs. He says the cart with given to him while walking in Kazakhstan. 735 days ago, or approximately two years, now-24-year-old Andrew Siess set off on an adventure to see the world with a backpack, a few camping necessities, some food, the clothes on his back and a sturdy pair of walking shoes. He was going to attempt to circumnavigate the world on foot. Now that he is back in the States and nearly finished with his journey, Siess has gained many adventures, memories and knowledge of the world, its people and himself. Siess recently re-entered the United States this past Monday, July 7, and he stayed with John Reitmeier at his residence north of Crookston. "Most of the time when I'm traveling – in fact, I'd say about 80-90 percent of the time, I camp wherever I can," Seiss explained. "Occasionally, though I'll be hosted by some locals or individuals who have kept up with me via news or my Facebook page, things like that." The young traveler explained that he was hosted the most by the generous people of Kazakhstan and Canada. "I'd say the most hospitable countries have been the Muslim ones." Seiss said. "Many Americans might raise their eyebrows at that – I mean, the news paints an image that all Muslims are terrorists. However, traveling the world has taught me that this is not the case. Through this trip I've learned that the world is good. I've been lucky and have had nothing but good experiences." Siess was found by his most recent host, John Reitmeier, via the ever-growing website Couch Surfers International, which connects international travelers with accommodations all over the world with willing hosts. "Andrew and I were able to communicate back and forth and see if we would be a good match," Reitmeier recalled Monday evening at his home. "What's neat, and what I personally enjoy about it, is that for the price of a bottle of wine and some steaks, I get to talk with – well, with someone who has walked around the world! How many people get to say that? It's something that I enjoy, and if I had kids I would want them to experience and learn from individuals who have seen more than just this corner of the world." Siess has certainly seen the world. With 21 countries under his belt, the adventurer started in Italy and plans to return to his home city of St. Paul, Minn. on July 20 before walking back to Italy to complete the circle. "There's not necessarily a point to the trip – I mean, it's a circle. [The point] is to have fun, meet people and learn about the world. It's kind of the ultimate challenge," Siess said. "When I initially conceived the idea, it seemed like the hardest thing anyone could possibly do. I guess if you had to put a rhyme or reason to it, it would be to raise awareness for adventure." 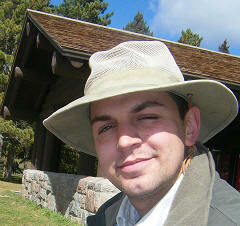 The St. Paul native always liked adventures and had a sense for it. When he initially began preparing for the trip, his parents and family were reluctantly supportive. "I think you have to be a little crazy to attempt something like this, let alone finish it," Siess explained. "But, I mean, look – they said that Martin Luther King, Jr. and Mahatma Gandhi were crazy. I'm obviously not them, but it just goes to show that people with perhaps revolutionary ideas or simply those who have the passion and strength to achieve their goals – whether it be a crazy adventure or not – might have to be a little crazy." Initially, Siess shied away from the news and was conservative in publicizing his journey. "The first man to walk around the world was actually from Minnesota," Siess explained. "He traveled with his brother, and when they were in a Middle Eastern country, they were televised on the news. They were supporting UNICEF, and said that they would be taking donations. However, after it was publicized they were robbed by bandits, who I guess thought they had all the money for their cause with them. But they didn't, and only one brother came out alive. "I hope to survive – that's the goal!" Siess continued as he laid out what he hopes to accomplish with the rest of his trip. "There's a high mortality rate among walkers – I mean, we're kind of just there. It's very vulnerable. "I think it's something that people either understand or they don't," Seiss continued, speaking about those who might question his adventure. "I think it's something about freedom versus safety. I mean, you can be in a padded room, the safest place in the world, and still not be entirely free. You have to be willing to take risks to experience life. And I want to do that – that's another point of this trip, I guess you could say. I want to experience life. I want to feel isolation, cold, extreme heat, love – and I think for the most part, I have. You can do absolutely anything – nothing can stop you." This isn't Seiss' first extreme adventure. 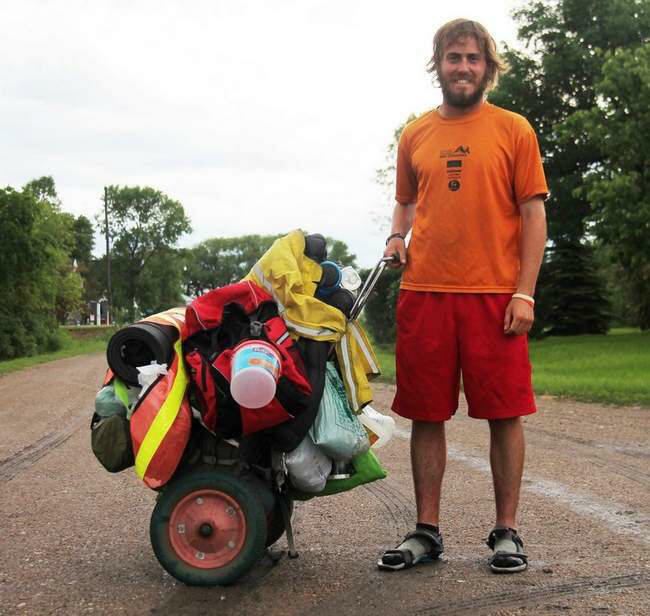 He has traveled the entire Mississippi River and has even biked from St. Paul to the southern-most tip of Argentina. He prepared for this adventure by running or walking everywhere. "I never drove anywhere," Siess said. "I didn't even own a car." He has gone through only four pairs of shoes. "Yeah, that's surprising to most people," Siess said. "But I wear them until you can basically see through them, about 5,000 km or 3,000 miles, each!" On a diet of mostly sandwiches and cookies, Siess has made a living for himself with not only money saved up for the trip but by playing his violin in places such as Italy, where he was picked up to play at a restaurant, a wedding in Kazakhstan and in the streets of Istanbul, Turkey. Siess is loaded with a makeshift "wheelie" cart that he was given in Kazakhstan, which carries his traveling necessities including a tent, sleeping mat, sleeping bag and food. "If I had to explain what it [the cart] was, I'd have to say it looks like a bum grocery cart," he said. However, traveling the world is not as expensive as most would initially think. "I guess it really depends on how comfortable you wish to be," Siess explained. "I mean, if you don't include the price of hotel rooms, air fare, gasoline and restaurants, it's pretty cheap to be able to travel and see the world in the most basic human form: walking. Almost anyone can do it." Siess has seen his fair share of trials along the trip. "Weather has definitely taken a toll – just different extremes in different countries. Sometimes, you find yourself doing pushups before bed just to try an stay warm. And sometimes it's just the hassle of logistics, what with getting visas for different countries and things like that," Seiss explained. "I'd say the hardest border to physically cross was the American one, however." That's due, he said, to the heightened security and extensive questions he was asked by U.S. Border Patrol agents. "However, it's exciting to be back in the United States – especially in my home state of Minnesota!" he said. "Even just seeing the license plates, something, anything familiar, that was exciting!" Siess met up with friend and world traveler Tom Mylnarczyk in Minot, North Dakota. Together, the two will continue on to St. Paul before the quest for adventure separates them. For anyone who is interested in following in Siess' literal footsteps, the young traveler has few words of advice: "Good luck! And bring waterproof stuff!" So what is the next big adventure for Siess? "I hope to write a book about my experiences," he said. "It should be done by next spring. Maybe next the Amazon River? I want to have as many come along for the ride as I can. But as for for now, I have to finish the current adventure. Life is an adventure." John's note: They both left on the morning of July 9th, off towards Bemidji, and then south to St. Cloud and into St. Paul!